What do you use a Wood Mallet for? I can’t count how many times I have been at a fair or farmer’s market and people have picked up our wooden mallets and asked “What do you use this for?” That is when a list starts running through my head because a wood mallet is one of the most handy things you can have around! I am not a big fan of kitchen tools that only serve one purpose or function. I have very few tools in my kitchen (except maybe my garlic press) that I don’t use for multiple tasks. The wooden mallet is NOT one of those one-task wonders. 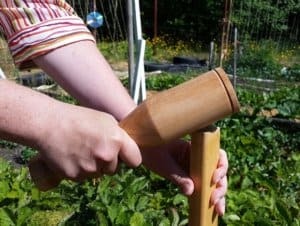 In fact, a wooden mallet is also very handy to have around for outdoor tasks as well. You’ll want to get two so that one stays outside and one stays in the kitchen. 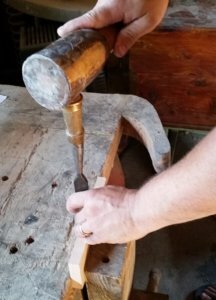 When looking for a wood mallet you want it to be made out of hardwood and fashioned out of one piece of wood for strength. Our hardwood mallets are handcrafted out of Maple on a lathe by The Carpenter. You can see them HERE. Meat that is an even thickness will cook at an even rate. A hardwood mallet has a good weight to help with that task but isn’t too heavy. It is easily cleaned after any cooking task. 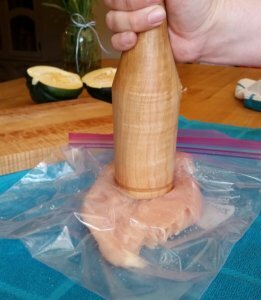 Simply place your piece of meat between two layers of plastic wrap or in a gallon bag. Pound evenly to get a uniform thickness. Then it is ready for making Chicken Cordon Bleu. NOTE: Many metal options are available for this task. Keep in mind that a metal mallet can very easily damage counters and wooden cutting boards. Acorn Squash are good for eating but they put up a fight. A good knife and a wood mallet make the job super simple. 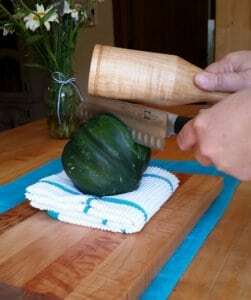 First, put the squash on a towel to prevent it form rolling. 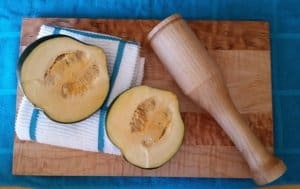 Place your knife on the squash and then pound it into the squash with your wood mallet. The wood mallet will not damage your knife. Once it is half way through, take it out, flip the squash over and pound the knife in again to split the squash. So much more simple than any other method. Pitting Olives can be time consuming and messy. Simply crowd a few olives together on a cutting board and give them a good wack. The pits are quickly pulled out. 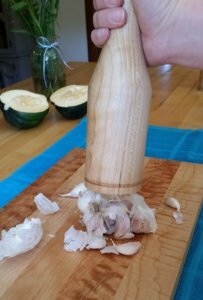 Breaking up a garlic head or getting the skin off individual cloves is a breeze with a wood mallet. 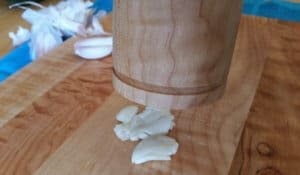 Your time spent peeling and mashing cloves is minimal when you use a mallet. Plus, you don’t get the garlicky smell all over your hands. One strike with a mallet on a clove and the skin will pop right off. Once the skin is off smash away with a little salt. Mincing Ginger and garlic can be a pain. 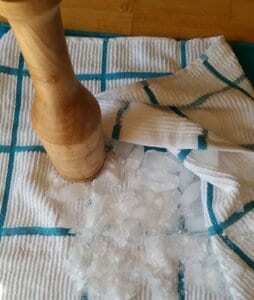 Once you are done giving it a rough chop, finish it up with a good mashing. If you add a little salt will also help the process. Cracking those shelled nuts can be a challenge. 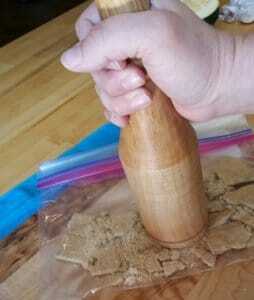 If you put the nuts in a bag or towel the end or side of the mallet make short work of the job. I must admit this is a favorite. You come home after a long day put some ice in a clean towel, wack it a few times and then you make yourself a cold drink and relax. Nothing like smacking something that doesn’t harm anything to release tension. As I said before I am not a big fan of one use items in my kitchen so I do not have a spice grinder. A plastic bag and a wooden mallet make short work of the job and I don’t need another specialized tool. 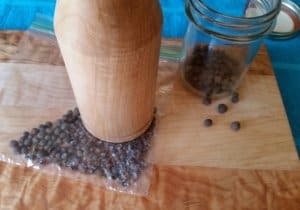 Just beware that your bag will likely tear in the process so the ground spices will have to stored in another container. Pounding a stalk of lemongrass will help release oils and flavors. Pounding leaves when making a salve helps infuse the oils into the salve. My Carpenter loves his wooden mallets. In fact he has several designs he uses on a regular basis. 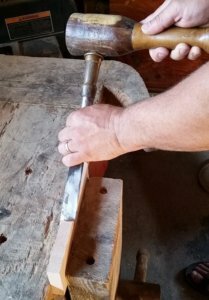 When using a chisel you never want to use a hammer with a metal head. It will dent and break the end of your chisel. 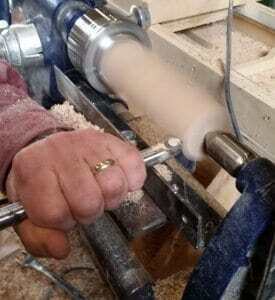 A hard wood mallet will not hurt your chisel handles and create less impact stress. 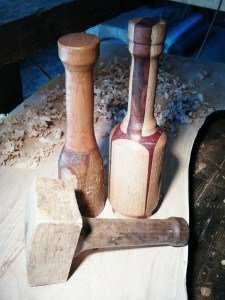 With a round mallet you can grab the mallet without taking your eyes off of your work, swing the mallet and know that which ever side is facing the chisel is going to work. The square mallets you need to double check that it is facing the right way before you swing. When driving wooden stakes into the ground you always want to use a wood or rubber mallet because a metal head hammer will damage the wood. 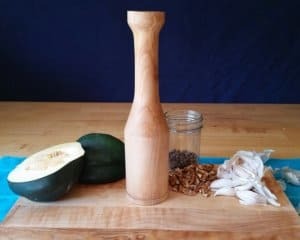 A wood mallet is versatile and can be used on many surfaces. When we go to local fairs and markets and people ask about our mallets the most common question is “Is this for bonking fish?” I love that question! It makes me smile. I tell them that it would work perfect for that. Invariably they then refer to “bonking” their companion. Oh my… people are so funny. So…It’s just got to go on the list because it would be a great tool for that. I have gone deep sea fishing only a couple times and fish are amazingly strong. They can easily hurt a person if not knocked a bit first. 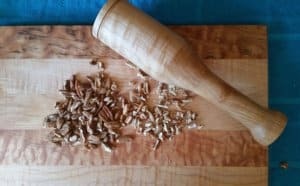 Do you have any more uses for a wooden mallet? Share in the comments! You can find our Maple Wood Mallets HERE. If you would like a specialty size or design you can also contact us for custom sizing at admin (at) ladyandthecarpenter(dot)com. People LOVE wood. I am often fascinated that people are inexplicably drawn to feel and touch wood items. Whether we are at a fair or the local farmer’s market people almost subconsciously reach out to “pet” our larger wood items. 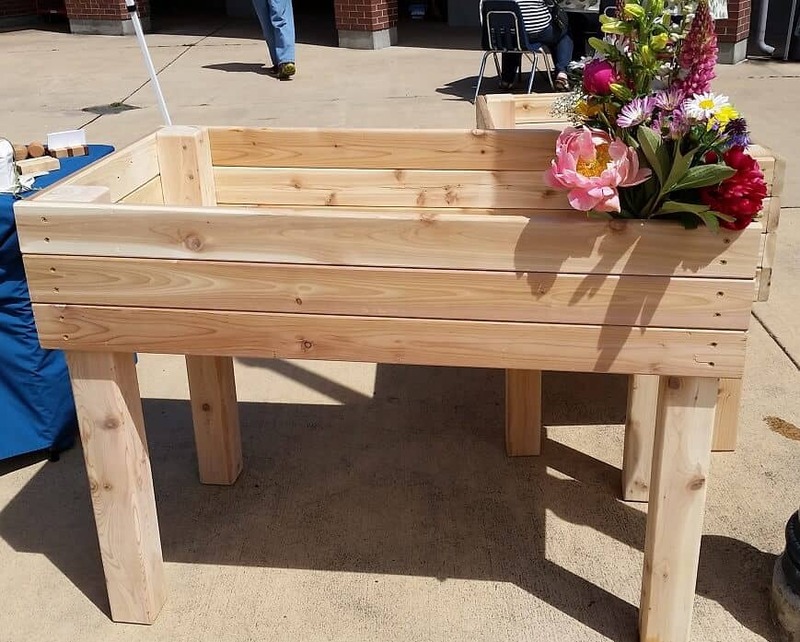 It doesn’t matter if it is a functional cedar planter box or a figured hand-turned piece, both draw people in. People love wood’s natural beauty. We love to see that beauty come out of any piece of wood. Often you do not see the detailed marbling or gorgeous grain patterns of a piece of wood until it is sanded to a polish and a finish is applied. That process gives joy to each piece we make. However, there is something special about custom pieces. Knowing you are making the item for a particular person in mind, using details that matter to them and knowing that it will be treasured when it is received is priceless. 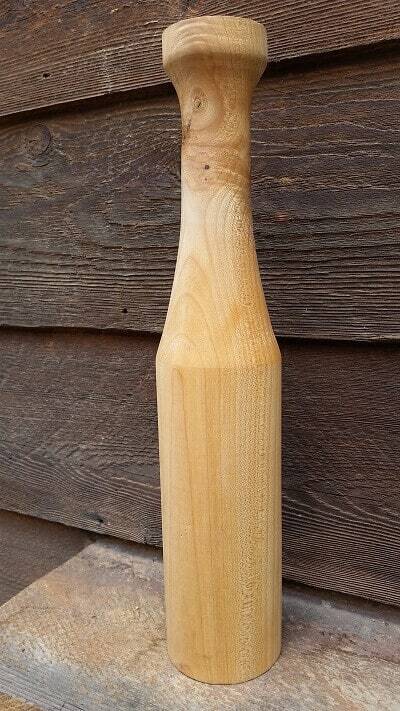 We create a standard mallet that we sell online. It is a great size for basic chisel work and basic kitchen tasks. 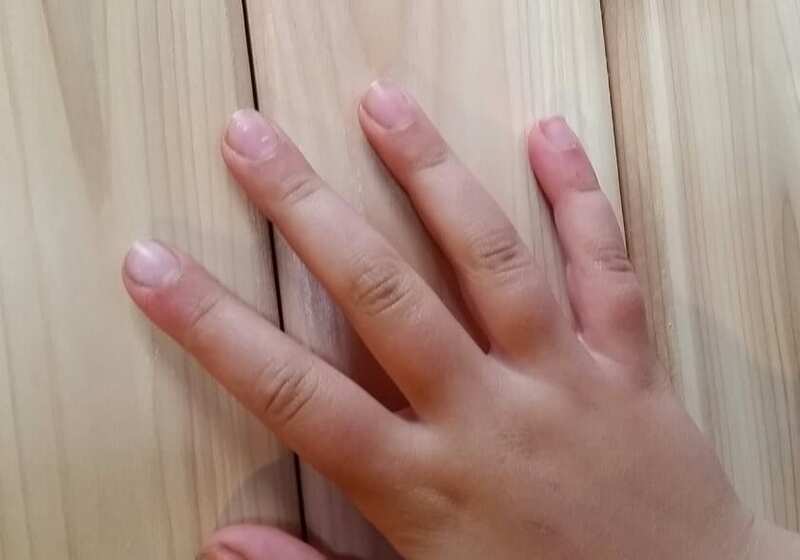 However, some people want a change the handle diameter to accommodate their hand size, they want a special wood pattern or want the length of the mallet to be different. We had a gentleman recently order a large mallet from us to pound in wooden stakes. His previous mallet was part of his daily job and finally broke after years of use. As you probably know, if you pound in a wooden stake with a metal hammer the hammer will damage the wood stake. So, he needed a mallet made out of hardwood. 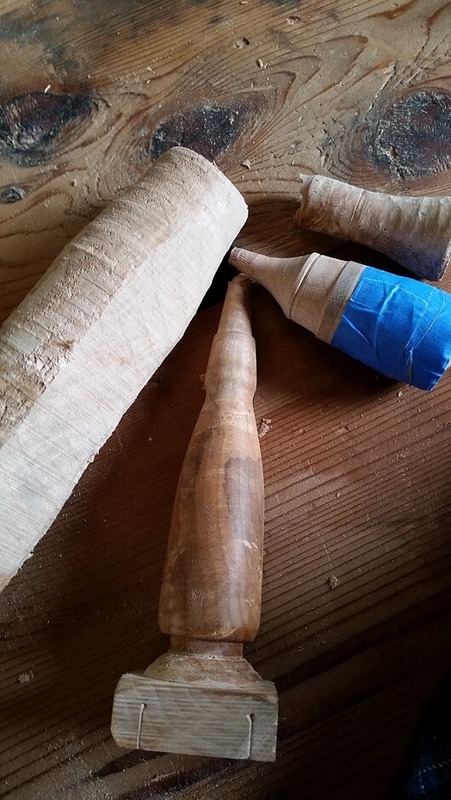 He sent us a picture of his old wooden mallet and we worked out final details over email. As you can see the old mallet was well used and loved. Our basic mallet just wasn’t going to cut it for this job. The custom mallet The Carpenter created was a beautiful and sturdy replacement. Speaking of custom wood items … mallets…. 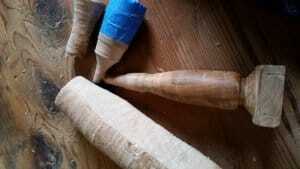 Here is a set of chisel handles and a matching mallet made by The Carpenter. 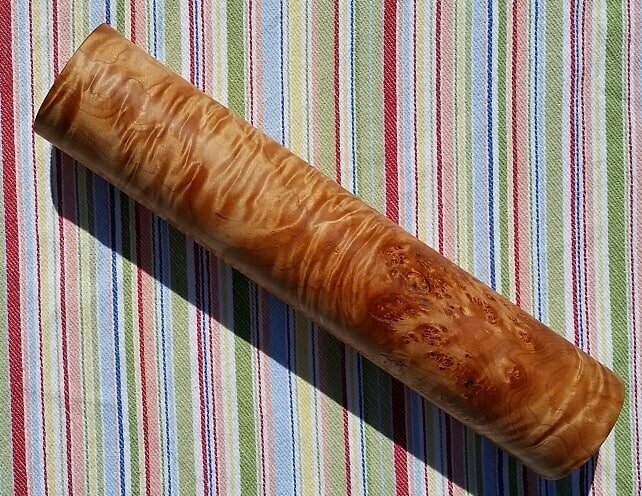 The customer mailed an example of he wanted for the chisel handles and The Carpenter made copies on the lathe out of maple burl. 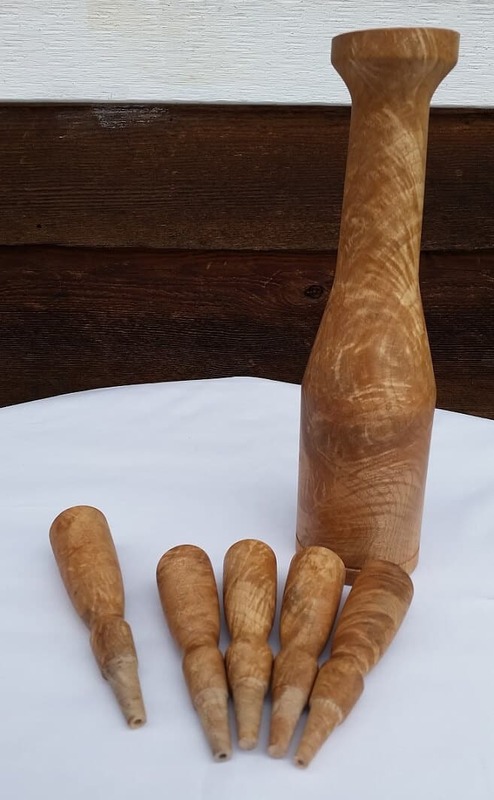 All 5 pieces were made to match as a set. Most of the items we sell have been inspired by customers. So, if you have ideas for new products send them on over. Here is a beautiful Rolling pin a customer requested specifically for tortilla making. Almost anything we make can be made with custom measurements so don’t hesitate to ask. We can change the design, shape, size and kind of wood of an existing item or create something new. It is only limited by your imaginations…If we do not carry the item you are looking for then shoot us an email. If you are in the Clallam County area in Washington State, we also make larger wood items. 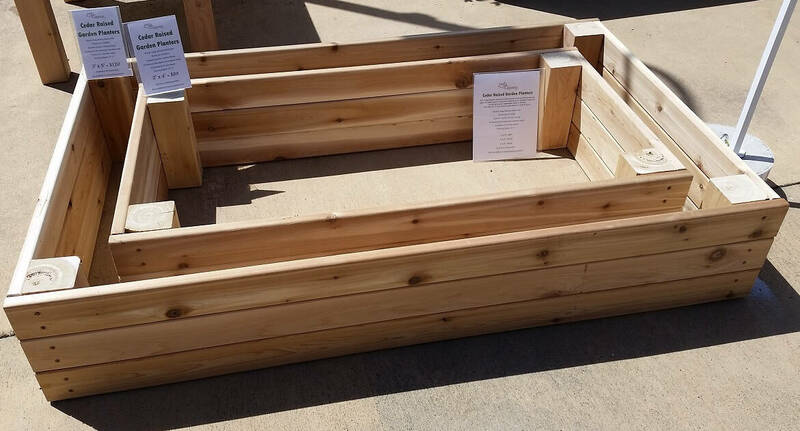 Custom sized raised beds, elevated beds, trellises or any of those larger wood items that you want custom made. 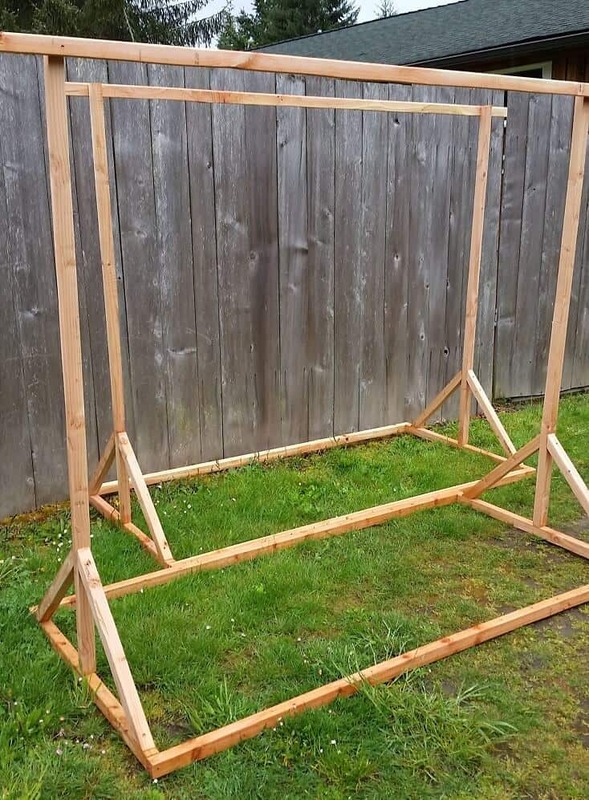 We can make anything from a photo booth frame for your upcoming wedding to cedar planters. 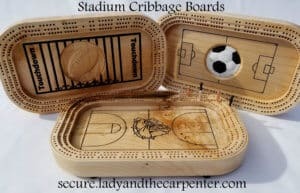 We have standard sizes available on our web store HERE at Lady and the Carpenter LOCAL. Contact us for custom sizes. 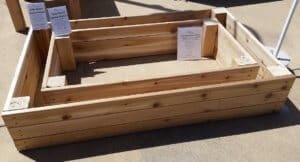 We have a few basic sizes of raised beds and elevated raised planters available for direct online purchase at our online store or you can contact us for custom sizing. 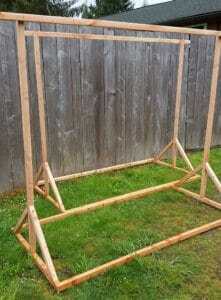 We also make other outdoor structures such as trellises. We can make what you dream up for your home. 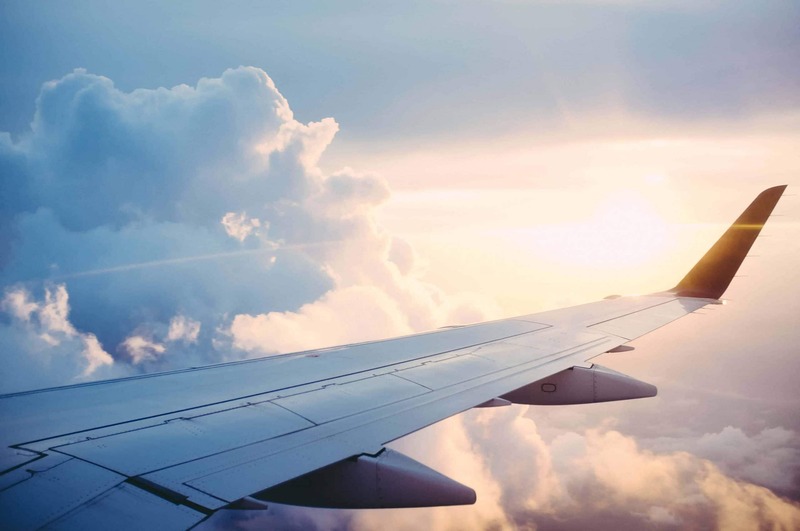 I’m leaving on a jet plane…Don’t know when I’ll be back again…. Yeah, always get that song stuck in my head when I take an airline flight. Off we go to North Carolina!! On May 6th and 7th we (my awesome Mom and I) will be at the Mother Earth News Fair in Asheville, North Carolina as a vendor. Hoping to see some of your lovely faces there! I really enjoy these fairs. The people are always upbeat and the weekend includes 2 full days of workshops on 13 different stages. They teach about everything from gardening to raising livestock to solar power. We stay really busy at our booth but I try to get away for at least one workshop or demo. One year we were by the stage where she butchered half a pig. (That was interesting.) This year I would love to see the soap making workshop or one of the fermentation workshops. I also LOVE making connections with people. 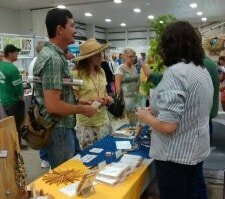 I reconnect with other vendors and speakers I have met at previous fairs. I get to know my neighbors and we joke through the weekend. I get to hangout with great people and share what we do. My favorites have to be those customers who try out a clothespin and then embrace it wide eyed (they tend to call themselves crazy. I tell them they are perfectly normal and in good company). We LOVE game time at our house. We try to have a game time at least once a week (even if it is just one quick game in the middle of the day). 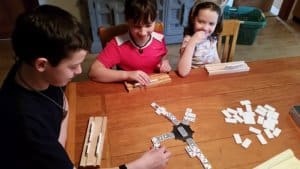 Not only is it an easy and free activity (if you already have the game), but I find that hanging out with your kids while playing a game can build strong bonds that really help in those times when it isn’t so easy to talk. If I am having a hard week with one of the kids I make sure they are part of game time. Usually all are smiling by the time we are done. 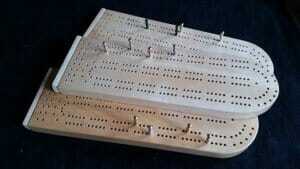 Domino Games are a standby favorite. 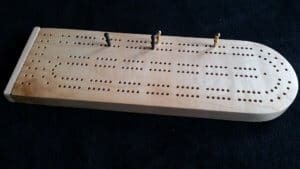 It is a easy game that all ages can play and most versions of play are easy and/or educational. I also LOVE Dominoes because it is so versatile. Most games you purchase can only play one form of that game. (Though my game shelf is testament that I love many of those too) There are over 100 different domino games out there. Dominoes is also one of our top favorites because it is an easy game to adapt to involve our kindergartner. Though Candyland is fun to play with her, Dominoes is much more engaging for all involved.